The Thunder Bay Museum is looking for Volunteers to sell tickets on this year’s Classic Car Raffle. 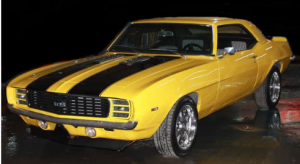 Every two years the Museum selects a vehicle for their special car raffle, This year the vehicle chosen is a 1969 Camaro RS, which has been professionally restored. It’s been given the full SS and Rally Sport Treatment. Proceeds from the raffle go directly towards helping with the operation of the Museum. The Museum requires several volunteers to fill their ticket sellers list for Malls, stores and event opportunities. If you have volunteered for the last Classic Car Raffle, you will know that people want to win one of these vehicles. Sign up now to assist the Museum with this important fundraising event.